BIG PRODUCTIONS USE FLUTTER FETTI®! You may not realize it, but you've seen Flutter FETTI® film and theater show confetti in Hollywood feature movies and TV commercials as well as in your local community. Our film and theater show confetti products have jazzed up "High School Musical" as well as countless high school musicals. Flutter FETTI® stage confetti mimics the effect of snow for "Nutcracker" ballet productions, and we've graced the lights of touring shows like "Dancing With The Stars," "Spirit of the Dance," "The Producers," and "Footloose." Whether the goal is to create a magical ambiance on stage or a swinging celebration, whether the desired effect is dancing butterflies or shimmering fireworks, Flutter FETTI® has film and theater show confetti products to meet any director's artistic vision. 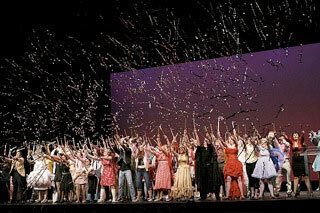 And Flutter FETTI® stage confetti can be cleaned up in a snap once the curtain falls. From game shows to Super Bowl Parties, Flutter FETTI® stage confetti is one of the best ways to announce winners and grand prizes. Our theater and film confetti products have fluttered around the famous winners of "Regis and Kelly" and "Who Wants to Be a Millionaire?" Glow in the Dark Die Cut butterflies enhance Busch Garden's Show "Takonga." Flutter FETTI® has been carefully designed to float longer in the air than conventional confetti, which makes it ideal to create a big look during long takes. 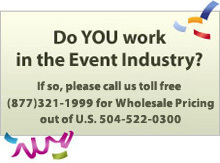 From the big screen to the little screen, Flutter FETTI® stage confetti adds beauty, fun, and excitement!